Artistic Direction for the conception of an electroacoustic studio-on line and a database of downloadable instrumental sounds (20.000 samples). CD-ROM for the exhibition at Centre Georges-Pompidou (also in Roma and Barcelona) about Time (January 2000). 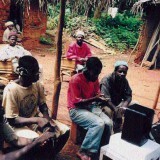 This set of patches has been written by Fabien Levy, adapted into an Open Music library by Jean Bresson, with the technical and ethnomusicological help and advises from Carlos Agon, Simha Arom, Gerard Assayag, Jean Bresson, Fabrice Marandola, Hans Tutschku and Frederic Voisin for an ethnomusicological travel in July 2001 to Cameroon (Nathalie Fernando, Fabien Lévy, Fabrice Marndola, scientific director: Simha Arom). 2) To propose statistical tools (curves, most present frequencies, mobile average, etc..) to help to determine the pitch-scale of the musical signal. 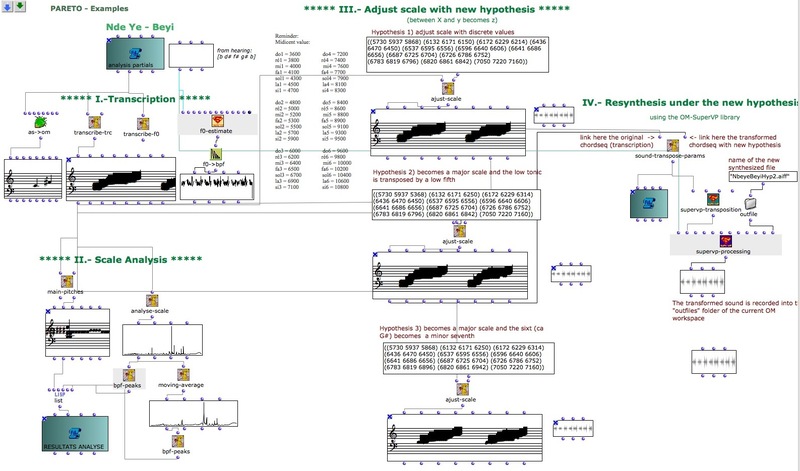 3) To change or adjust the musical signal with new hypothesis (new scale, or discretisation, etc..), and then to make similar changes of the scale on the acoustic signal itself (through microtransposition on SVP). Pareto is a library for the Ircam Software Open Music. Download Pareto here (go to the bottom of the page, section “More OM libraries”) and decompress it. This folder must be installed in the folder OpenMusic/Userlibraries. You can use for the spectral analysis the Ircam Software Audiosculpt or freeware Spear or any FFT software, and Audiosculpt or SuperSVP for the resynthesis of the sample under new hypothesis. The libraries OM_ASX and OM-SuperVP are requested to run Pareto. There are included with the Ircam Forum Open Music version. Open OpenMusic, and then the library Pareto. Be careful to have in your preferences the right path for the SVP software. Work for computer solo, circa 15′, Commissioned by the Festival Inventionen, Berlin. Dedicated to Ingrid Beirer, Folkmar Heim and Thomas Seelig. Is it possible compose a mini-composer ? 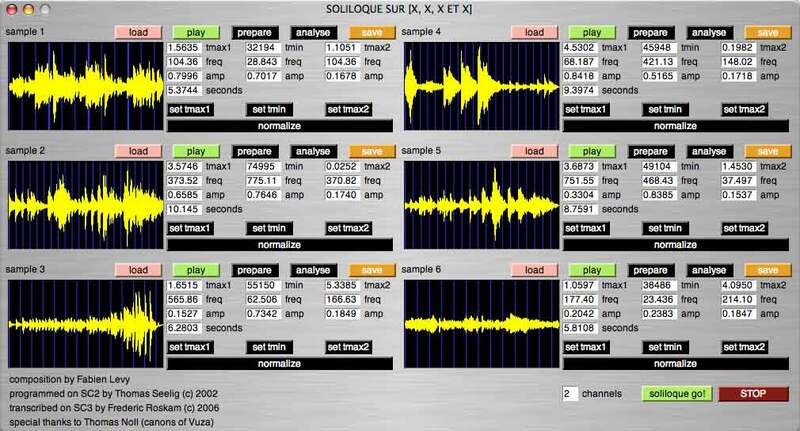 SOLILOQUE about [X, X, X et X] (the X’s are to be replaced by the first names of the composers of the other works which are used as samples, for example Soliloque about Pierre, Wolfgang and Williams) is not an actual work, but more a meta-score that the computer generates in real-time from the analysis and extracts of other pieces played during the concert. This means that the generated work is different for every concert, not only because the materials constituting this mosaic originate from the sonorities retained from other pieces, but also because the organization of the mosaic is itself transformed according to the analysis of the samples. The goal here is not for the listener to recognize extracts replicated from other works of the concert (the extracts, which are no longer than twenty seconds, are generated from a chord here, a signal there, etc..). It is rather to keep the spirit and the color of those extracts in order to generate a “score”, and then to use them as “instruments” to interpret this score. The goal of this project is also to generate a slightly different piece for each performance (or more precisely, a different interpretation of the same piece). Indeed, the style of the composition remains the same, my own, without any randomness. In other words, it is not the computer that interprets the concert, but the concert that interprets the work, Soliloque. This project of a meta-work depending on the context has allowed me to further develop and abstract some compositional techniques that I was using in my instrumental music. These techniques are however transposed here upon the sonorous phenomenon. Indeed, those techniques operate more on acoustical and psycho-acoustical parameters of sound than on traditional parameters like rhythm, tone, or dynamics. Here, the techniques are elaborated not on tones but on sound objects, not on rhythm but on position of reading and on duration, not on intervals but on the speed of reading, not on nuances but on intensity, filtering and spaces. I wrote this contextual meta-score entirely with the software SuperCollider, within the possibilities and constraints that this “instrument” proposes, and with the precious help of Thomas Seelig, musical assistant, Frederic Roskam for the complex porting on OSX, and of Thomas Noll for the mathematical calculation of the ‘Vuza canons’.
. Download the Soliloque Stand alone version SoliloqueOSX StandAlone.zip (Jan. 08) HERE (7 Mb), and decompress it.
. Sound manager / drivers: Supercollider, the software behind Soliloque, can work with the default Apple sound manager installed on your Mac. This driver is however only stereo. Supercollider also works with many other sound cards (Motu, Digidesign/protools, etc..) if you want to run it in multichannel. Once these drivers are downloaded, place them in the right folder, and change the sound manager in the Apple preferences. Important: activate the multichannel soundcard BEFORE opening Soliloque. Possible known bugs: possible crash in case of too long path betweens the different elements. If you see any difficulty, simply put your sounds in a folder on the desktop, and everything not so far from the Soliloque software. Soliloque about [X, X, et X] (the X’s are to be replaced by the first names of the composers of the other works which are used as samples, for example Soliloque about Pierre, Wolfgang and Williams), is a music piece generated from six samples which come from other pieces, for example from the pieces played previously during the same concert. Soliloque works for 1 to 16 channels. By default, the number of channels is 2 (stereophony), that can be changed in typing the desired number in the related box and in pressing enter. Musically, four channels at least are better to obtain the complex space moves requested in the piece (in the premiere, Soliloque was played on 12 separate channels).
. Upload with the [LOAD] red button six monophonic, 5 and 20 seconds long (in any case shorter than one minute), preferably musically interesting (so that the listener might occasionally recognize the samples when quoted in Soliloque about …), contrasted (in color and dynamic) samples. They can for instance be excerped from pieces played before in the same concert. When the right sound file is loaded, its sound wave appears in the window. By default, Soliloque puts any prepared sound in the folder [sounds].
. For each uploaded sound, click the black [PREPARE] button. Soliloque will then prepare the sound file (and the sound will automatically be heared during the preparation). Please wait until the end of the preparation before starting any new operation.
. Redo this operation for each sample. Possible known bug: the first time you open Soliloque, the information “File ‘Soliloque.app/Contents/Resources/sounds/Sample1.wav’ could not be opened.” appears in the white windows. Don’t worry! Solliloque chooses per default the last opened sound before you choose a new one, and in this case, doesn’t find anything.
. The computer needs three strategical points for each sample. They can be automatically or manually choosen. When automatically choosen by the computer, those points correspond to two maxima and a minimum of the sample.
. First push the black key [AUTO-ANALYSE] for an automatic analysis. Numbers will automatically appear within a few seconds in the related boxes [tmax], [freq], [amp].
. If you want to manually choose your own points, select them in the sound wave window, click the buttons [Set tmax1] (for the position tmax1), [Set tmax2] (for the position tmax2) or [Set tmin] (for the position tmin). The related values will appear in the corresponding boxes. You can always hear your choice or a region of the sound in selecting a region and pushing the button [PLAY].
. Pushing the [SAVE] button will save all your choices: samples, analysis, and the chosen positions for the next opening of Soliloque (therefore, the result won’t be affected if you close the interface).
. Click now on [Soliloque go !] to play your realisation of Soliloque. Possible known bug: be careful to have no ZERO in the analysis (it will crash Soliloque). If you have a zero, it generally means that more than the half of your sound is silent. In this case, choose manually three points where there is a sound. -> Musical tip 1: we noticed that Soliloque “works” better when particular points are manually chosen: precise, contrasted, semantically consistent, colored points. Also, the form “works” better if the strongest points (Tmx and Tmax) are really energetic, and if Tmin is softer (they are more contrasts in the piece).
. Soliloque is a work with space’s effects. 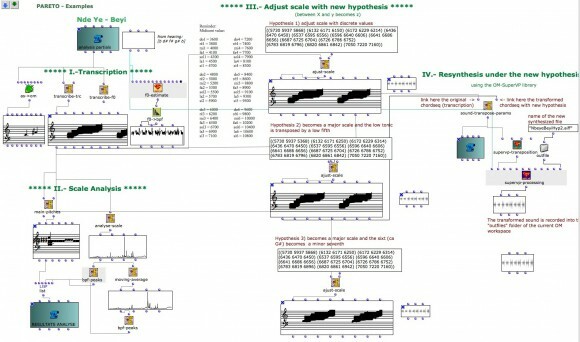 This means that it is musically better to play Soliloque with many channels (4 to 16 channels). The space movements and amplitude of each sound are controlled very precisely by the computer.
. we also advise a light general diffusion of the piece with a mix table in order to increase the contrasts and the “human qualities” of the piece, and a light reverberation of the entire piece.
. Soliloque works much better in the dark or almost without light (for concentration purposes). Soliloque about [X, X, X..] is a freeware . It can be freely played for public or private audience. We only request concert organisers to respect the construction of the title of the piece (Soliloque about [X, X, et X], where the X are the first name of the composers of the samples), to aknowledge the name of the authors (Fabien Lévy -composer-; Thomas Seelig and Frederic Roskam – musical assistants), and to quote the program notes written above. This work is protected by the SACEM (French society for copyright). We also would be happy to be informed about any concert programing Soliloque and to receive a record of your version of Soliloque.